500 is a trick-taking game for 2-6 players, usually and most enjoyably played with 4 people. 500 is largely a social game. Players play in pairs, with paired players usually placed diagonally opposite to each other. Tactics often revolve around using various means to indicate to one's partner information about the hand one possesses, including agreements to make certain bids depending on whether one possesses specific cards (rather than on what the player believes they can realistically win), and surreptitious signals (by the tone of voice, exact words used to indicate bids, and so on). Craft Group is up and running for members and/or visitors. Come along with your own craft materials and/or project/s and share your ideas and knowledge with other participants over a cuppa. 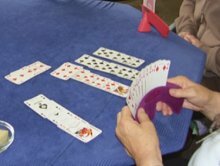 Hand and Foot is a card game related to Canasta, in which each player is dealt two sets of cards - the hand, which is played first, and the foot, which is played when the hand has been used up. The most usual version is for four players in partnership..
Mah Jong is a game that originated in China, commonly played by four players. Mah Jong is a game of skill, strategy and calculation and involves a certain degree of chance. The game is usually played with a set of 152 tiles based on Chinese characters and symbols. Patchwork is a fabric ensemble that is created when smaller pieces of fabric, often called patches, are sewn together. Large pieces of patchwork can be created by joining random or identical patches, or by first sewing pieces of fabric into smaller blocks, then joining the blocks. Backgammon is one of the oldest board games known. It is a two player game where playing pieces are moved according to the roll of dice, and a player wins by removing all of his pieces from the board before his opponent. Backgammon involves a combination of strategy and luck. With each roll of the dice, players must choose from numerous options for moving their checkers and anticipate possible counter-moves by the opponent. 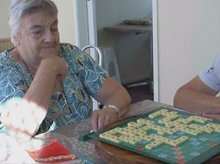 Scrabble is a word game in which two to four players score points by forming words from individual lettered tiles on a game board marked with a 15-by-15 grid. The words are formed across and down in crossword fashion and must appear in a standard dictionary. Texas hold 'em (also known as hold'em or holdem) is a variation of the standard card game of poker. The game consists of two cards being dealt face down to each player and then five community cards being placed by the dealer, with players having the option to check, bet or fold after each deal. Individuals compete for chips contributed by the players themselves (called the pot). 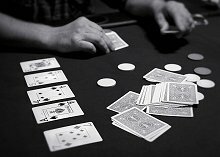 Because the cards are dealt randomly and outside the control of the players, each player attempts to control the amount of chips in the pot based on the hand he/she holds.